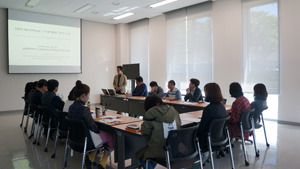 The Department of Intangible Cultural Heritage at Tokyo National Research Institute for Cultural Properties has been conducting research exchanges with the National Intangible Heritage Center in the Republic of Korea since 2008. During the exchange, staff members of each institution stay at the other institution to conduct research while holding joint symposiums. As part of this research exchange, Tomo ISHIMURA, Head of the Audio-Visual Documentation Section of the Department, stayed in Korea for overseas research for two weeks from April 23rd to May 7th, 2018. The objectives of overseas research currently was to research the movements of anthropological and ethnological studies made by Japanese researchers in the Korean Peninsula during the colonial period and to critically redefine their significance today. In this instance, research was conducted to retrace the steps of Professor Seiichi IZUMI (1915-1970), who worked as an assistant professor at Keijo Imperial University in the Korean Peninsula until the end of the war and was involved in the establishment of Japan’s first Cultural Anthropology Department at the University of Tokyo after returning to Japan. During the first half of the research in Korea, Tomo ISHIMURA visited Jeju Island where Professor IZUMI conducted research in the 1930s and 1960s, in order to organize a hearing survey in the villages that Professor IZUMI had visited. The society on Jeju Island drastically changed due to the Jeju uprising that lasted from 1948 through 1954. It resulted in the replacement of most village residents. Fortunately, ISHIMURA could meet an old man who had been living in the same village since the 1930s when Professor IZUMI conducted the first research. ISHIMURA succeeded in clarifying the tangible changes in the village. Through research, Professor IZUMI defined multiple families who jointly owned a flour mill as a “molbange (mill) association” by regrading such a group of families as a unit comprising the social aggregation on Jeju Island. 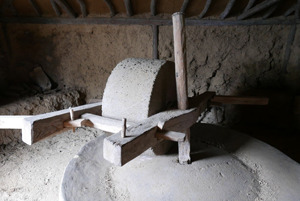 However, through the current research, ISHIMURA found that the use of the mill almost ceased from the 1950s to 1960s and that not only social changes but also mechanization of flour milling affected the extinction. Through this study in Korea, ISHIMURA confirmed that Korean society including Jeju Island drastically changed during the prewar and postwar periods and that former anthropological and ethnological research materials are significant today in understanding such changing processes. Last but not least, we would like to express sincere gratitude to Myung Jin LEE (National Intangible Heritage Center) and Doc Woo LEE (Kanagawa University), who supported his study during this research exchange.